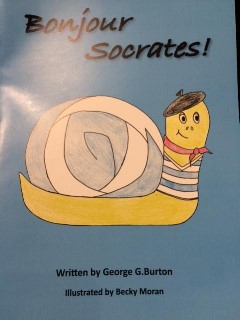 "Bonjour Socrates" is the second book in the "Socrates the Snail" series of children's books for adults too. It describes another series of breakneck encounters, this time in France, as Socrates attempts once again to find his way back to his home on the roof of the Regina Hotel in Sorrento. He faces challenge after challenge, defying the odds against enemies old and new, despite having no control over where he is moved to by both humans and other creatures. A spider, a group of rats and a cat are just some of the new friends he makes during this new adventure which will leave you breathless with excitement and begging for more. The illustrations for this book were drawn by Becky Moran, the granddaughter of George's cousin Renée Rapa who also acts as his distribution Manager. Several themes from the first book are repeated here, including meeting a famous person and ending up in a surprising place and George thinks that these ideas will continue in the third book which he hopes to write in 2019.